Ridiculously good Neapolitan pies with wonderful names, such as the Abe Froman with pork sausage, red onion, and Grana Padano and the Chardie Sheen with swiss chard and speck. A Bay Ridge classic for over 50 years. The slices at Gino’s are big and cheesy, but we recommend getting a personal pie (and adding mushrooms). Some of Queen’s best pizza can be found at this spot known for its Sicilian slices, which come with plenty of cheese and a tart sauce. The spicy chicken is another strong contender. 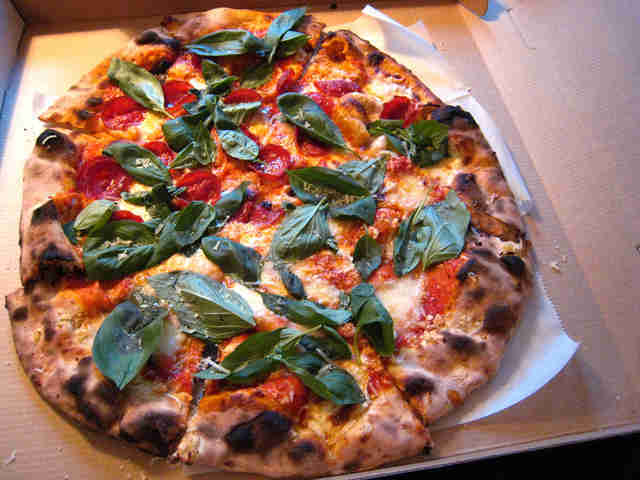 This Halsey St gem offers a number of great Neapolitan pies, from a solid margherita to the coppa and carciofi with fresh mozzarella, spicy salami, and artichoke hearts. The crust on the Neapolitan pies at Sottocasa is neither thick nor thin -- it’s somewhere perfectly in between, with just the right amount of char. The move here is the taleggio pizza with mozzarella, taleggio, and heaping amounts of prosciutto. Where the pizza master at Saraghina learned his trade! Luzzo’s is a cute neighborhood spot offering top-quality Naples-style pies (are you sensing a theme here? 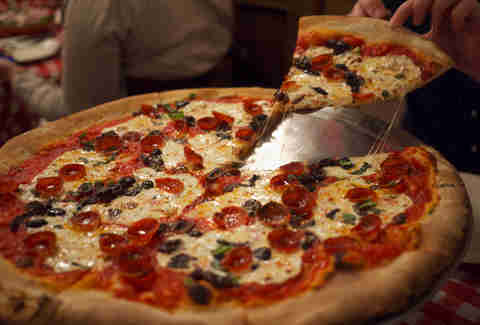 ), with a standout spicy Diavola pie. It’s been named the absolute best in the city and some of the best in the country for a reason. Yes, you will wait forever, but goddamnit if that pizza isn’t worth the wait. 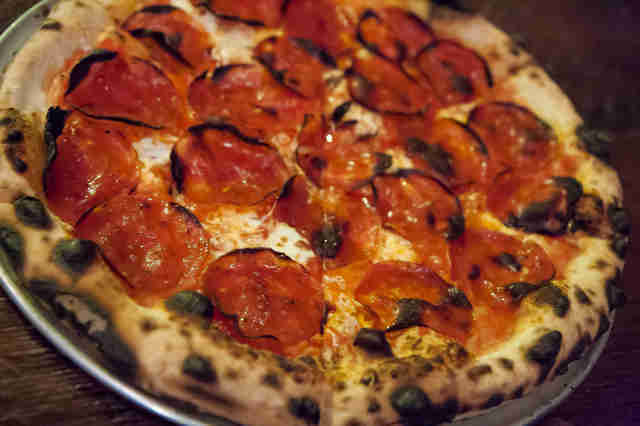 Roberta’s takes the Neapolitan style and truly makes it its own, nailing the pizza-to-sauce ratio like no one else. Be sure to get the Speckenwolf with speck, mushrooms, and oregano or the Bee Sting with spicy soppressata, chili flakes, and honey. 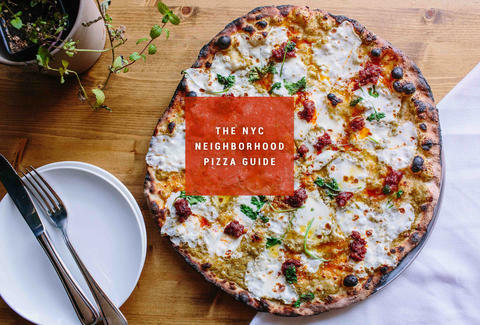 There are only two things on the menu at Lucali -- pizza or calzones -- and that pizza, repeatedly named some of the best in Brooklyn, is truly a thing of beauty. It’s got the perfect crust, plenty of cheese, and excellent toppings. Get a large pie topped with garlic & basil, parmesan, and pepperoni (it’s just the right amount of spicy). A Staten Island staple, Joe & Pat’s offers no-frills thin-crust pies and slices with tart sauce and beautifully greasy cheese. The pepperoni slices are so heavily topped, you can barely see what’s beneath. Sullivan St. Bakery’s Jim Lahey obviously knows his bread, so this is not your average pizza crust; it’s light without being flimsy, a little bit crunchy, and charred in all the right places. Sam’s is a classic; an old-school checkered table cloth joint run by the same guys for years and years (look out for the always entertaining Louie). It’s a place that will always feel like home, where you can get wonderful brick-oven pizzas without any pretension whatsoever. A Coney Island institution, and one of the oldest pizzerias in America, offering thin crust pies with a sweet but not too-sweet tomato sauce and delicious fresh mozzarella. 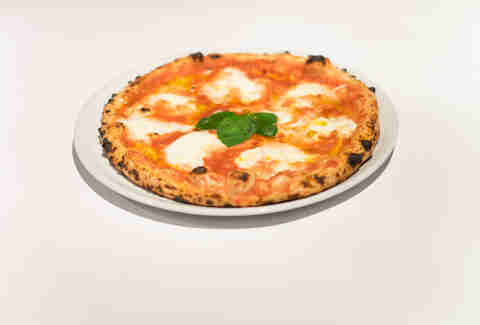 Get a traditional margherita or opt for the half red/half white margherita/bianca combo. Crispy crust, good cheese-to-sauce ratio, and super generous toppings. Also: brunch pizzas! This was a tough one, with Juliana’s going head to head with Grimaldi’s (which you’ll find below under Flatiron, because there’s one there too!). 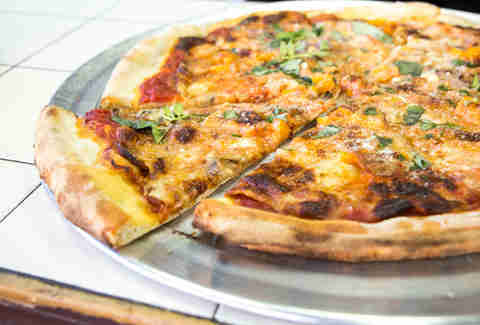 But in Dumbo, Juliana’s is the winner, with perfectly thin coal-fired crust, great homemade sauce, and lots of cheese. Get the margherita and add pepperoni. 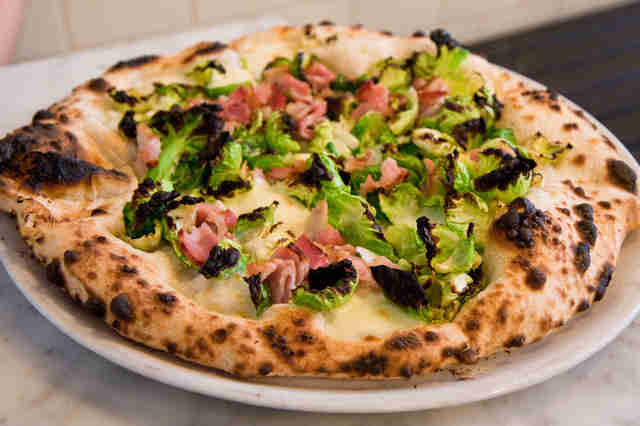 Lauded as one of the best pizza places in the country, with equally great praise from the pie experts, Motorino is king in the East Village, offering a seriously amazing Brussels sprouts pie with fior di latte, garlic, pecorino, and smoked pancetta. 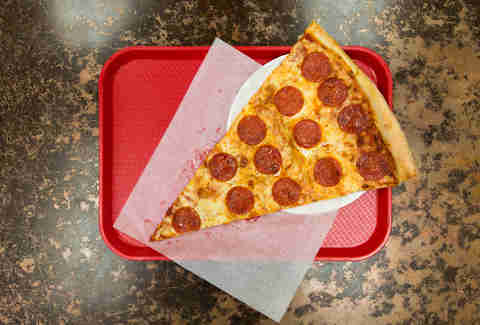 Louie’s is a true neighborhood gem with a great grandma slice made with fresh ingredients and a crisp crust. 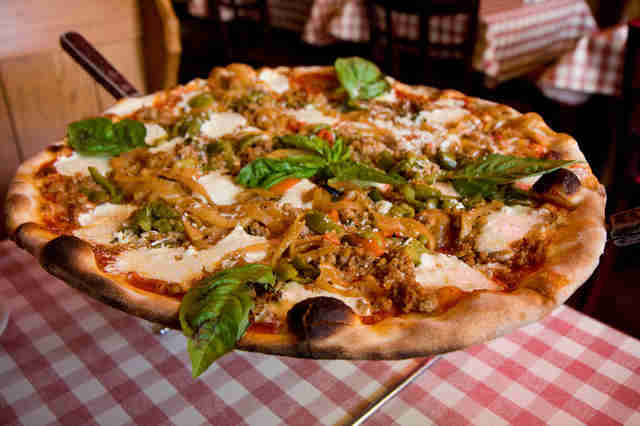 Brother’s is a Staten Island institution -- a family-run establishment doling out some of the Island’s best pizza. 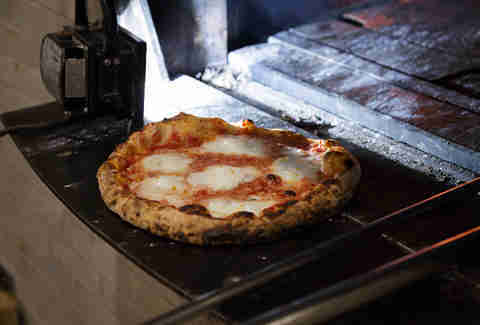 Get a margherita or a grandma slice; both are always super fresh and dripping with cheese. This Stone St spot has a number of super solid “old-fashioned” pizzas (rectangular) or 12” pizzas (round). Go for the old-fashioned and pack on the toppings. The classic red checkered table cloths and crispy crust you know from Dumbo, with the added bonus of not having to wait in an hour-long line! 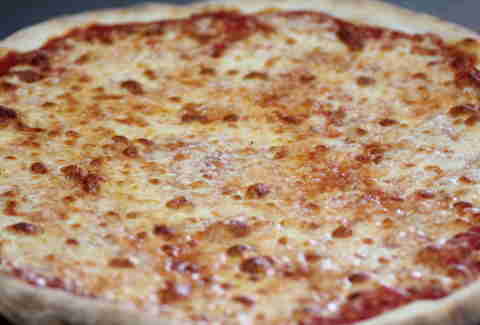 A perfect $2 regular slice with thin crust, tasty homemade sauce, and the right amount of mozzarella. One of the best restaurants in Queens, Nick’s is an old Forest Hills standby, known for well-charred crusts, super-fresh melty mozzarella, and quality sauce. Another spot offering some of the best pizza in Queens, Brother’s is a totally no-frills slice joint that’s been around for over 50 years, beloved by locals and Alec Baldwin alike. 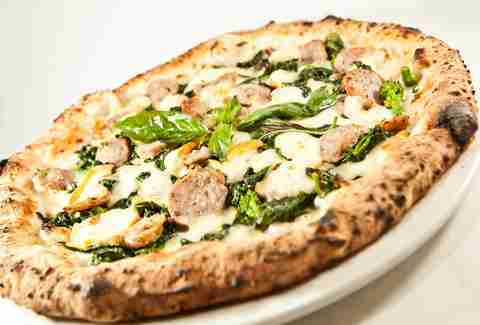 The pizza at Posto comes with an ultra-ultra-crispy thin crust and a wide variety of toppings. Get a custom regular pie and add sweet Italian sausage and pepperoni. 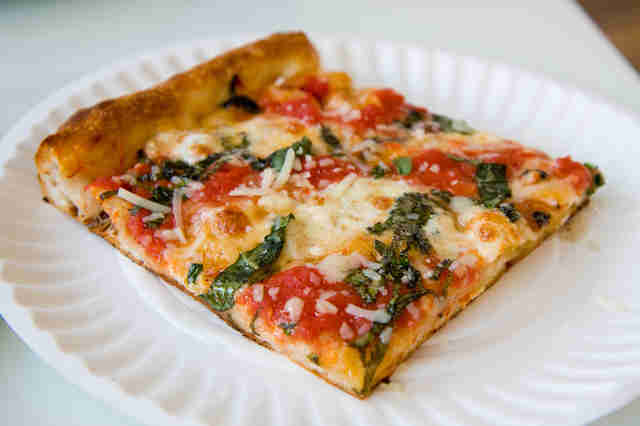 The square slice here is something you absolutely must check off your NYC food bucket list -- a doughy Sicilian slice topped with lots of fresh mozzarella and a rich tomato sauce on top of that. It’s messy and delicious, and it’s best eaten outside on one of the red picnic tables. Another place touted as having some of the country’s best (as well as the city’s best, AND Brooklyn’s best), and with good reason. Paulie Gee’s nails the Neapolitan pie with chewy, perfectly blistered crust, and inventive options like the Hometown Brisket with Hometown Bar-B-Que's incredible brisket, or the Monte Cristo with gouda, Canadian bacon, and maple syrup drizzle. 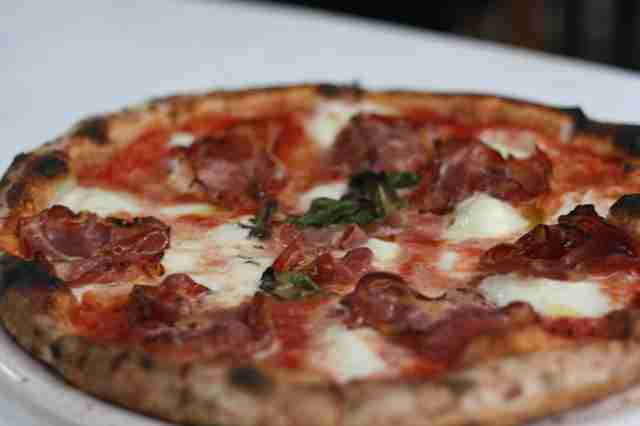 There’s also the always-great Hellboy with mozzarella, sopressata, Parmesan, and Mike’s Hot Honey. The original Patsy’s, and a New York institution since 1933. Go here for the comfort of a quick, classic, super-cheesy $1.75 slice (or, at $12, a full pie isn’t the worst idea, either). 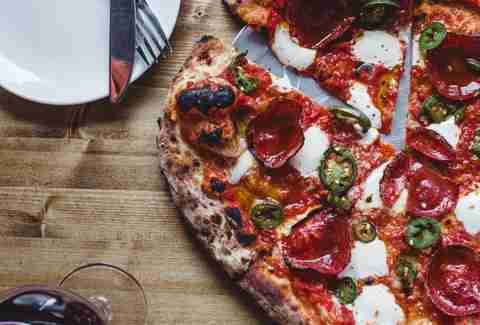 With a menu of inventive wood-fired pizzas, Annabel stands out in restaurant-packed Hell’s Kitchen. The san marzano tomato sauce, fior di latte, and basil number is great, but if you’re feeling like something a little less basic, grab the ricotta, duck prosciutto, and blueberry chutney pie (which totally, completely works). So, Lombardi’s is officially in Nolita, but it’s been around since 1905 -- way before Nolita was even a neighborhood, when 32 Spring St was still considered Little Italy. It may be touristy, but it’s still some of the best. Cash only, no slices. 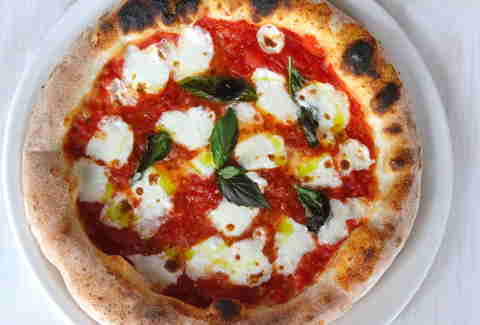 Get the original margherita. 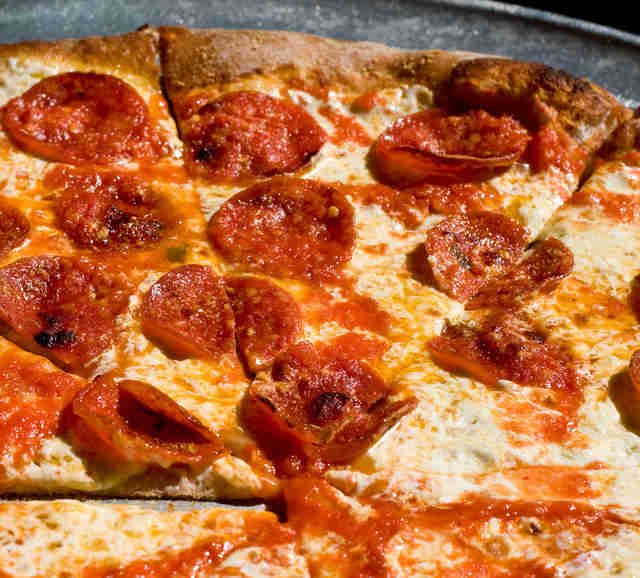 Stanton Street Pizza and Rosario's are both solid options for pizza on the LES, but Nonna’s super cheesy grandma (Nonna) square slice is hard to beat. There are a number of Nonna varieties here, including one with penne a la vodka and one with Buffalo chicken, but the real winner is the Nonna’s “Magic” slice with fresh mozzarella, Nonna’s secret sauce, and basil. Solid thin crust slices and pies made with fresh, local ingredients. 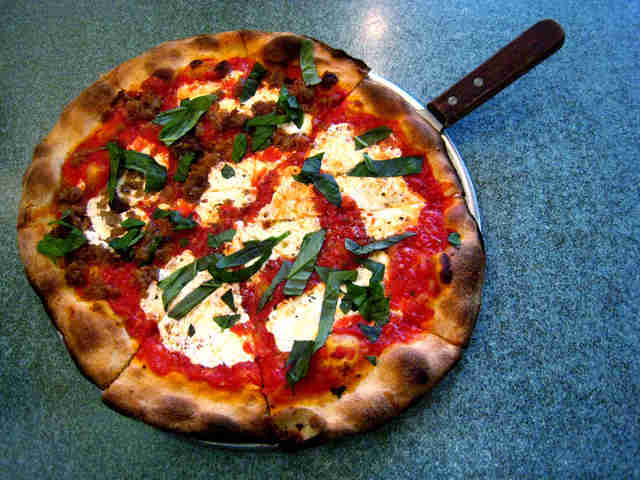 Get the NYC Round pie with a tasty tomato sauce, fior di latte, grana padano, basil, and extra-virgin olive oil. My Pie offers a wide variety of square slices that are small enough to allow room for trying a bunch (like eggplant parm and chicken alfredo). This place is TINY, so your best bet is to get your pizza to-go. Montanara pizza (pizza that is deep fried, then baked) is one of the greatest gifts (curses?) from the pizza gods, and PizzArte does it well. On the off chance that you don't want your pizza fried because you’re a completely insane lunatic, there are also a number of good regular Neapolitan numbers, as well as gluten-free options. Get the fried pizza. 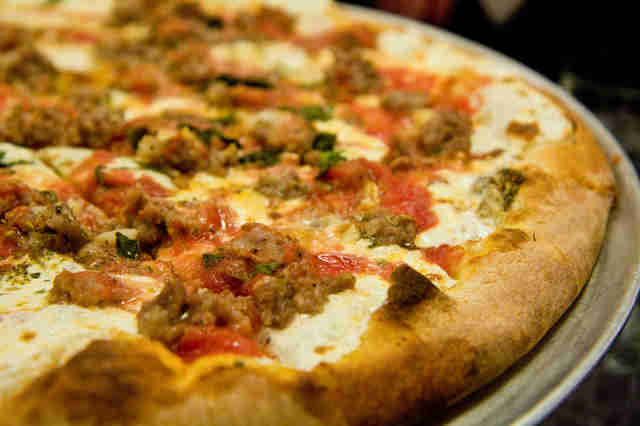 You already know that Di Fara has some of the best pizza in NYC and in the country. And you also probably already know that you’re guaranteed a wait... but Dom DeMarco’s San Marzano sauce and Grana Padano, mozzarella, and Parmesan cheese blend is well worth it. 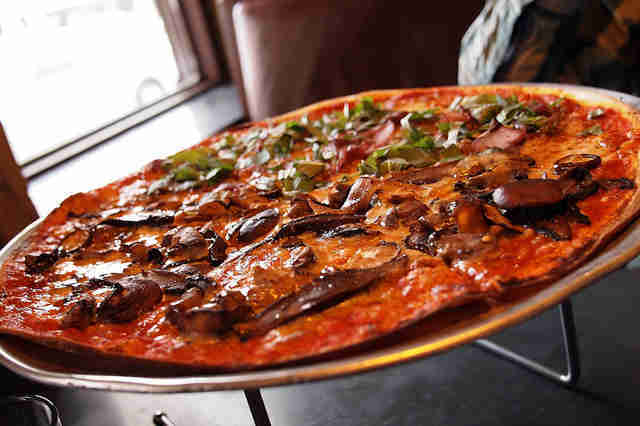 Get the Classic (mushrooms, onions, sausage, peppers) -- it’s a true pizza masterpiece. Vezzo’s got super crispy, inventive thin-crust pizzas, like the Tres Fuegos with spicy marinara, shrimp, chorizo, and manchego or the Parma with prosciutto crisps, millionaire bacon, arugula, apples, and balsamic reduction. 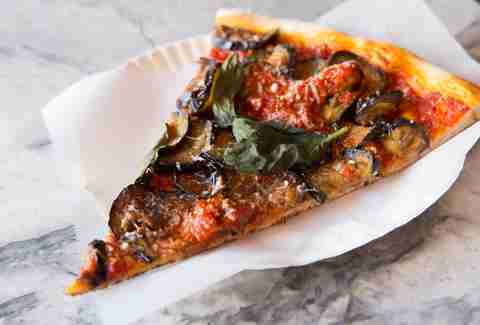 A tough decision, as Rubirosa makes some truly fine pizza, but Prince Street has our heart. It’s got one of the best square slices you’ll ever have, topped with the loveliest little grease-filled pepperonis, plus an equally great vodka slice. This Roman-style pizza joint from Danny Meyer offers a truly beautiful stracciatella pie, but the move here is the patate alla carbonara -- potatoes, guanciale, egg, and pecorino. A Staten Island staple, consistently offering delicious crispy pies dripping in cheese and sauce (be sure to get your pie well-done). The Garbage Pie with sausage, meatballs, pepperoni, mushrooms, and onions is a gift from the hangover gods. 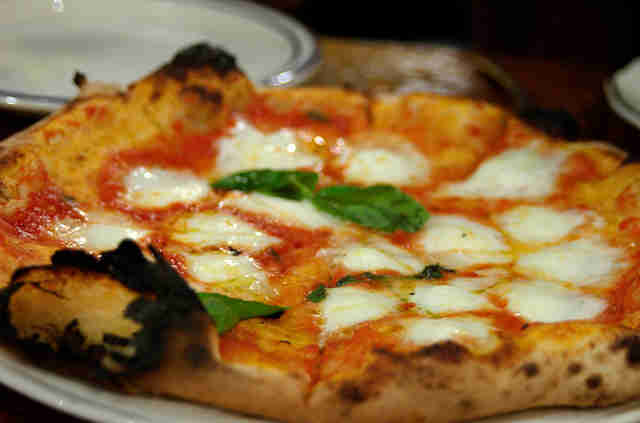 One of the best in Brooklyn, and NYC overall, Franny’s uses strictly locally grown ingredients for its Neapolitan pies. Get the tomato, sausage, and fior di latte, or the suburb clam pie cream, chili, and parsley. At its first brick-and-mortar location, Brooklyn Flea/Smorgasburg’s beloved wood-fired pizza purveyor is doling out seriously delicious pies, like one with green tomato salsa, jalapeño, fontina, mozzarella, and pecorino, and another with bacon fat and rosemary. Yes, bacon fat. 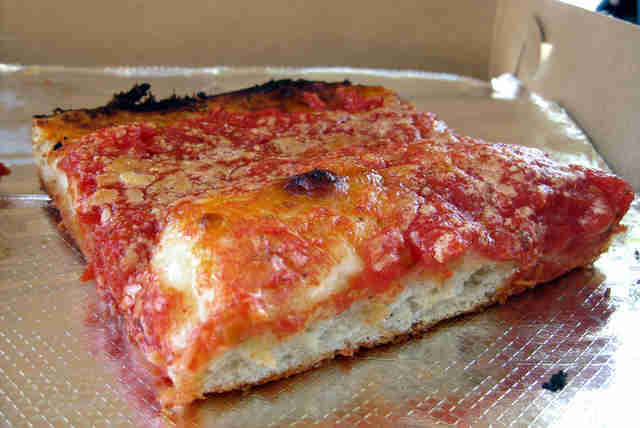 Rosa’s has quality margherita and Cesar salad slices, but the move here is the Sicilian with crust that’s soft with a slight crunch, followed by a layer of cheese, and a layer of tart tomato sauce on top of that. No slices, nothing gluten-free -- just damn-good wood-fired pizzas, a surly owner, and a few “fucks” thrown around. Get the Cavolini with Brussels sprouts, pancetta, fior di latte, and pecorino, or the equally great salsiccia e vongole (sausage and clams). One of the best pizza places in the Bronx, offering one of the best white pies in the entire city. Be sure to add sausage. Ben’s has been around for ages, and boasts a devoted clientele. There’s nothing fancy here, but if you’re not the mood for a regular slice grab a Palermo: a no-cheese square number with tomato sauce and breadcrumbs on top. A friendly neighborhood pizza joint that doesn’t feel like it’s in Tribeca, Saluggi’s boasts pies with a thin crispy coal-fired crust and lots of fresh mozzarella. It's known for its Brussels sprouts and grandma pies, but the menu features a create-your-own option, as well as number of specialty pies, including the Italian Deli with salami, ham, caramelized onions, provolone, Parmesan, and mozzarella. Using strictly Neapolitan ingredients (that includes the flour and yeast), Ribalta crafts delicious Neapolitan pies that, because of said flour and yeast, are lighter than other similar pies. So go ahead and order two pizzas! Maybe even three! Get crazy! Pro tip: if you’re dining with non-gluten eater, Ribalta also offers gluten-free pizza. No individual slices here, but that’s okay, because you’ll want an entire one of these flavorful, brick-oven pies (get the half-red/half-white). 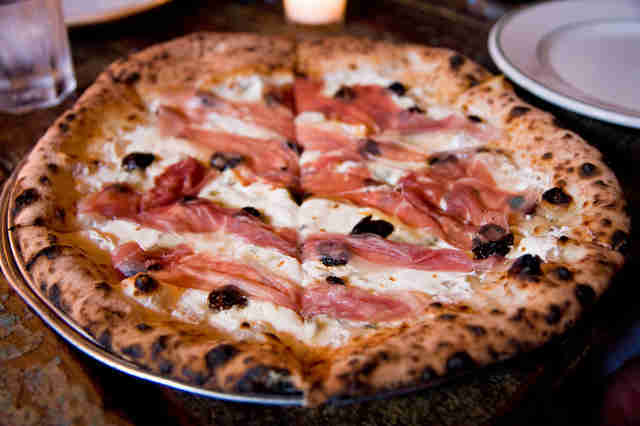 Order the namesake pizza -- truffle cream, mozzarella, and prosciutto. Die happy. And fat. It would appear that there is more cheese than crust on the slices at George’s, and we are completely OK with that fact. As much as we love John’s and Keste, we have to give it to the original Joe’s for having the best pizza in the West Village. Get a plain cheese slice (or two, or seven) at 12pm or 3am, take a bite, and feel like you’re high-fiving a million angels. 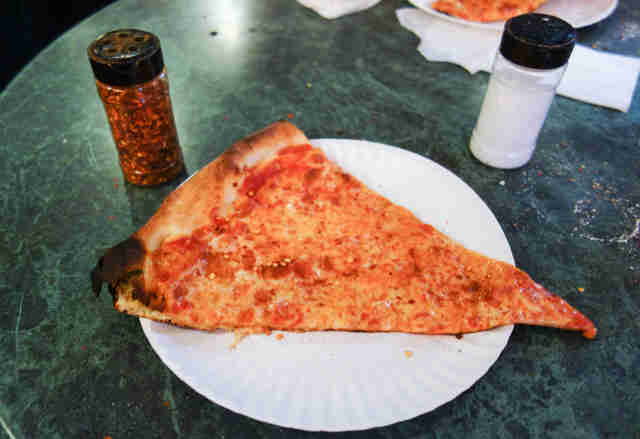 Though Best Pizza is a strong contender, Williamsburg’s best best is found at Williamsburg Pizza -- simply great, classic slices (get the grandma slice, or better yet, a whole pie of it), with no frills and lots of cheese. Lucy Meilus is Thrillist’s New York Editor and has never tried pizza. Follow her on Twitter and Instagram.